3 cross dependability, one a Salsa Delgado rim, the other a Sun Rhynolite. Solid! 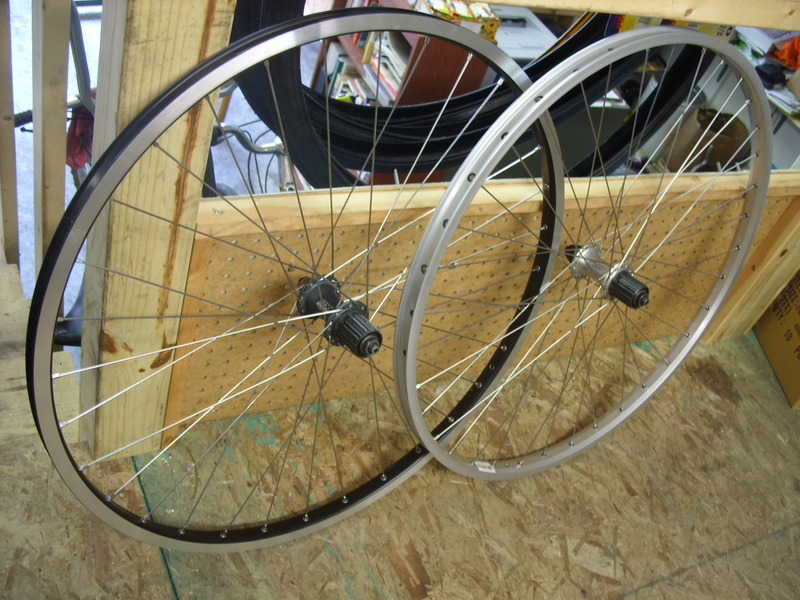 I found a stash of 32 hole Mavic Open Pro rims and got one for myself, which I built 3 cross style to my Dura Ace hub. 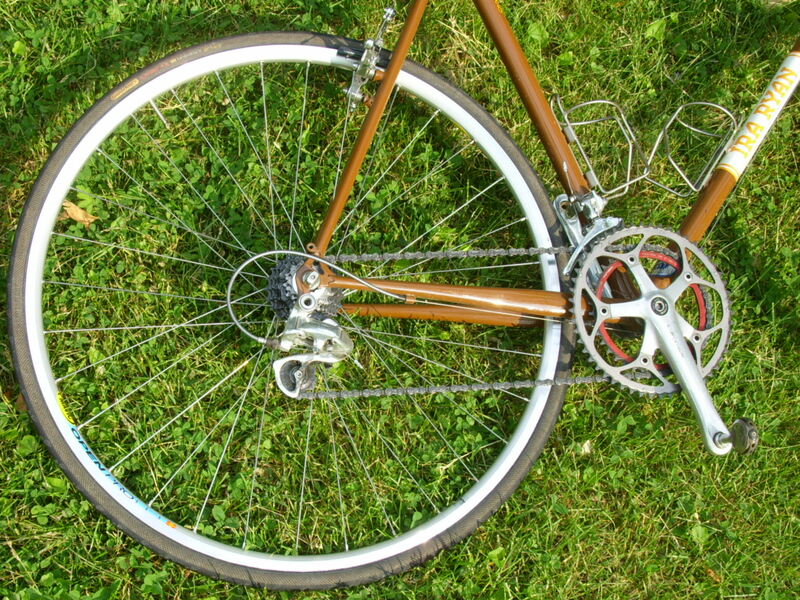 This is a great wheel and I am looking forward to many miles with it, 200 of which are coming up next weekend. 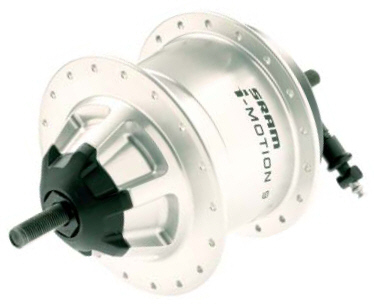 We are seeing much interest in the new internal gearing offerings and have the parts in to build a SRAM 9 speed hub to a Sun CR18 rim. And a 7 speed SRAM just came in for another wheel build. Yup, it is a little smaller than the i-9. We will share pics when they are built, of course! Friday night turns into Saturday morning. What seems to be turning into a biweekly tradition, folks gathered around the shop & Benji’s coffee cart yesterday around 4:00 for some good, old-fashioned socializing and flame-juggling. By 6:15 we had all packed up and moved on to our various Friday evening events. For Steve & me it was the Bike to Work Week finale party at Vito’s. 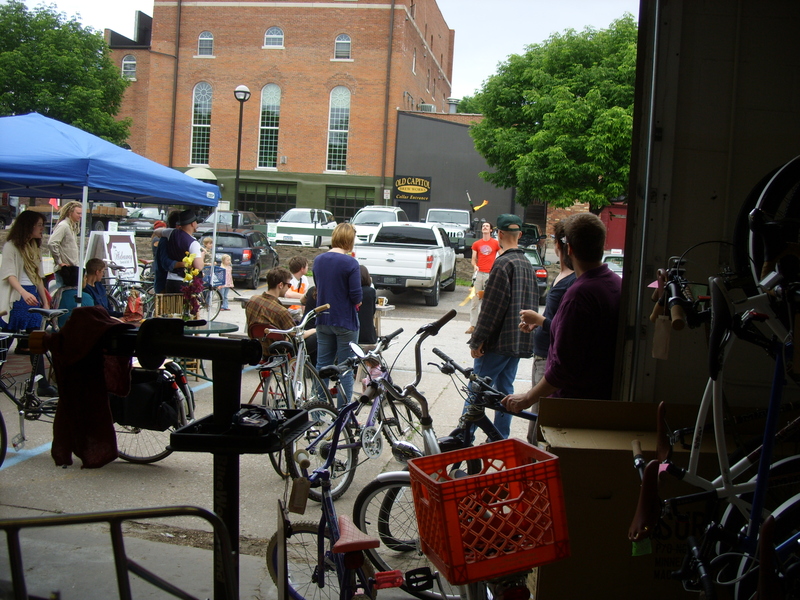 This morning the shop & cart are again a popular gathering spot, including these loaded bicycles. Ready for an overnight camping trip, four fellas outfitted themselves with the finest caffeine in town before heading south. In other words it’s business as usual around these parts. 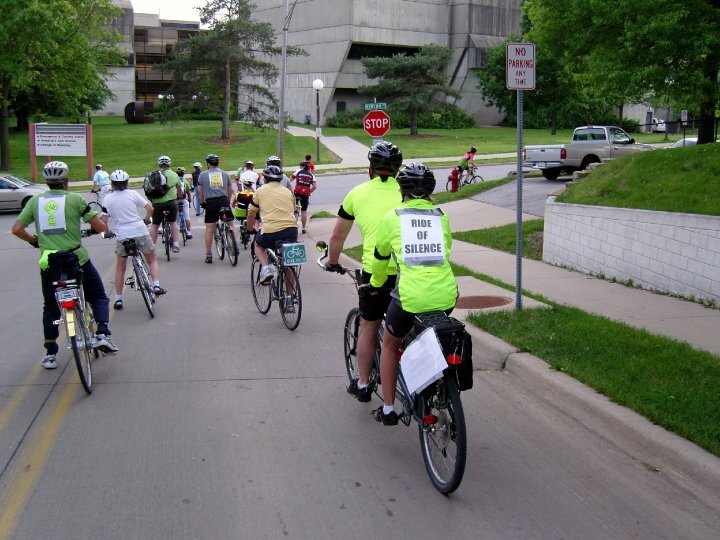 Last night I (Steve) rode the Ride of Silence here in Iowa City. There were about 40 of us that gathered in the ped mall downtown and rode around town for 90 minutes to remember those who have been injured and killed while riding bikes. It is always a tough ride for me. I know far too many people who have been hit by cars while riding, including Cody, and I have known a couple who have been killed, so I ride in their memory. Thanks to the organizers and those who rode with me. Photo courtesy Donald Baxter. Thanks Donald! 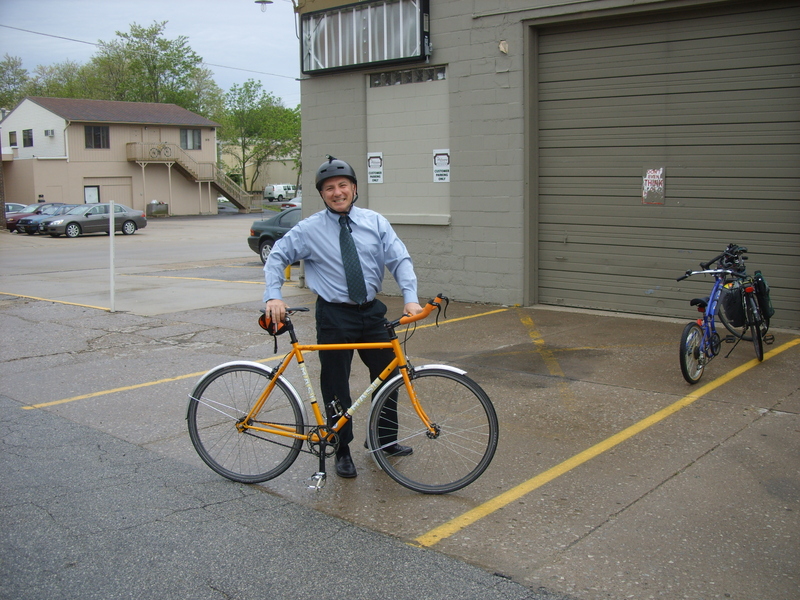 Tonight the focus is back on Bike to Work Week with the now classic Old Pi to New Pi ride! We will be gathering at Chauncy Swan Park across from City Hall at 5:30 and riding to the New Pioneer Coop in Coralville where the New Pi will have food and music. We will be closing at 5:30 so we can enjoy the ride. 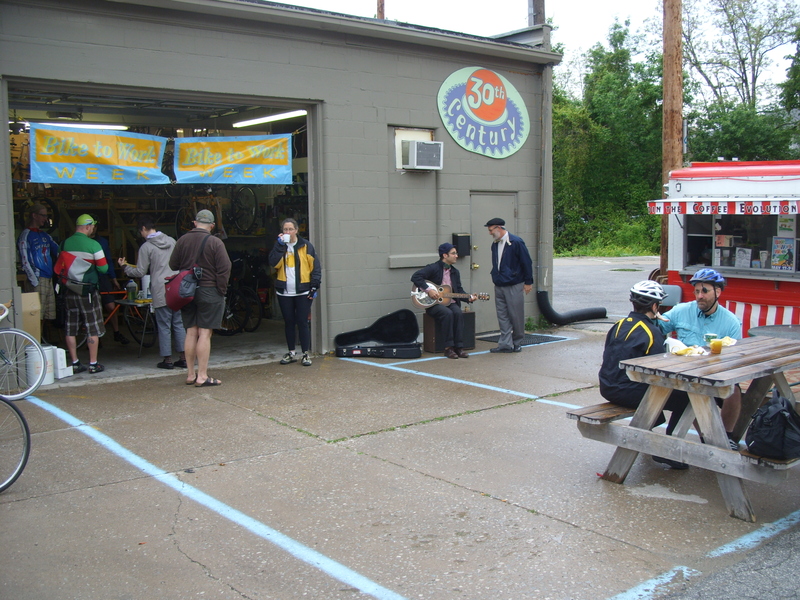 Yesterday began Bike to Work Week 2010, and we had a breakfast here at the shop to celebrate it and to encourage folks to give it a try. 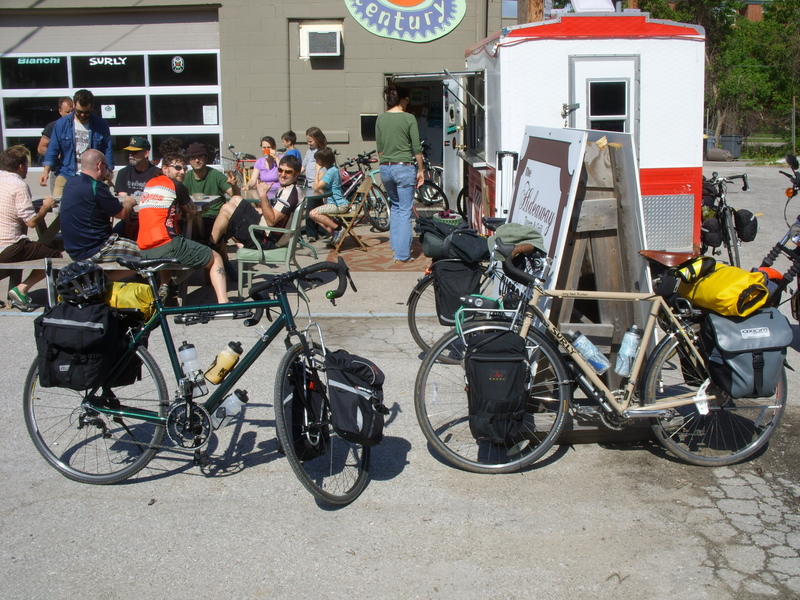 Cody and I have organized these events before for Bike to Work Weeks gone by and for the Bike Library, too, but we have never had one before with such excellent food / coffee / music. It was drizzly at first but dried up quickly. We had quite the crowd! Some of Iowa City’s best dressed commuters showed up. 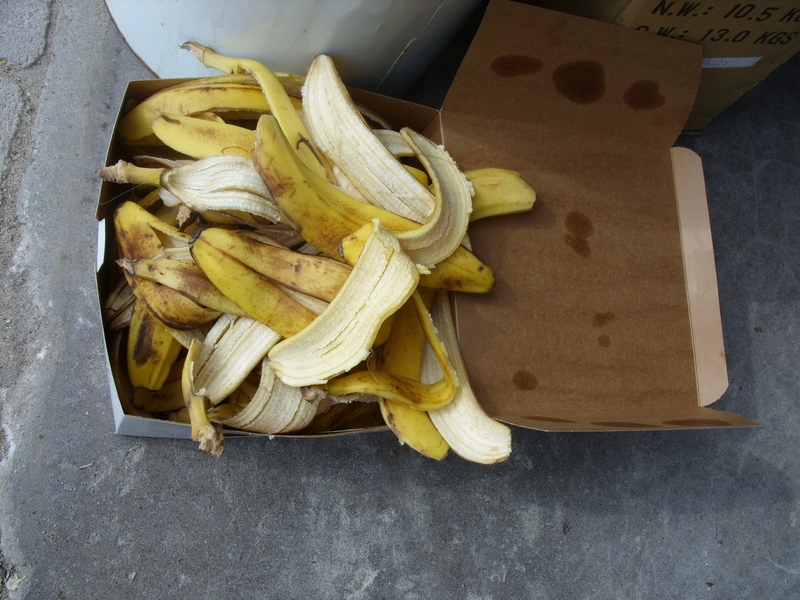 Who ever heard of a banana peel spill? Thanks to the Red Avocado for the muffins, the Clean Bean Cafe for the espresso, and Dustin Busch for getting up early and playing for us. And thanks to all of you that rode to work and stopped by! 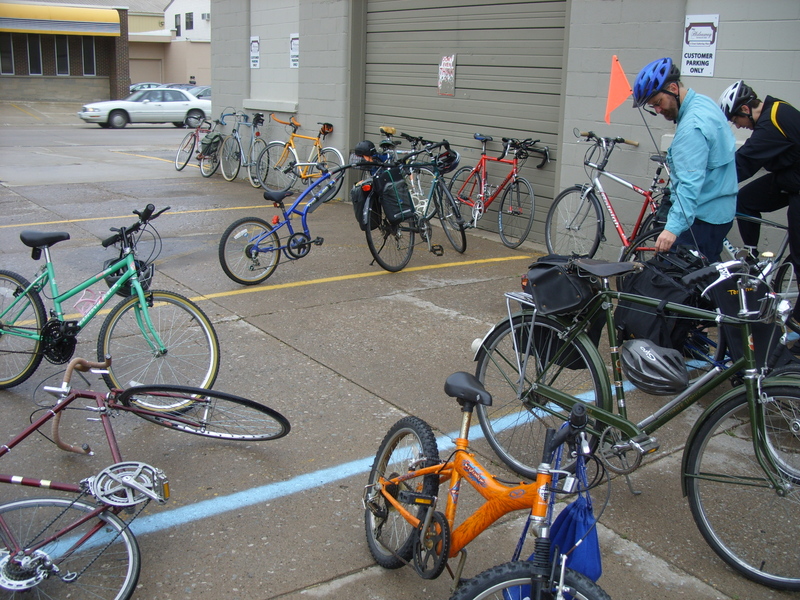 Details are shaping up for our Bike to Work Week Commuter Breakfast. 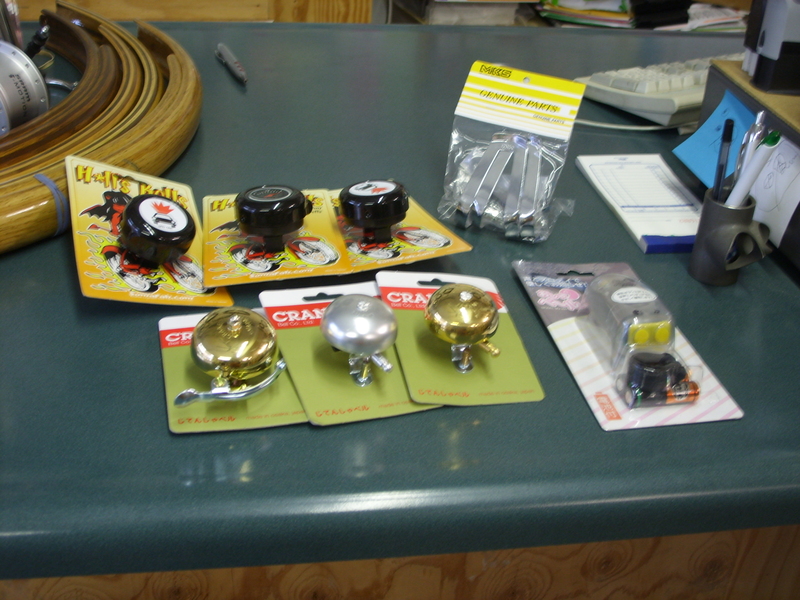 It will be next Monday, May 17th, right here at our shop from 7:30 to 9:30 in the morning. 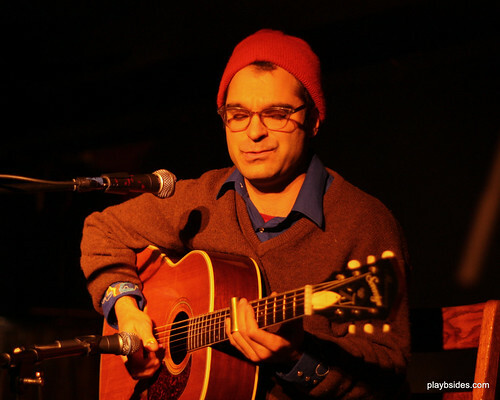 There will be muffins and iced chai from the good people at The Red Avocado, Ben’s Capulin espresso, and (if he can get out of bed) live music by Dustin Busch! Swing by on your commute and help us celebrate the start of B2WW while we help you fuel up for your Monday. Check the full Iowa City schedule of events here. More commuter news, to complement our Momentum Magazines and MK Fenders we have taken delivery of some incredibly nice commuter bike bits this week. 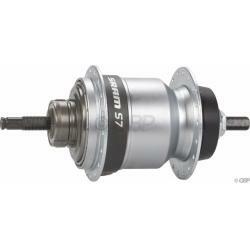 The 4+ pound SRAM i9 internal geared hub will be built up to a Sun CR-18 rim. 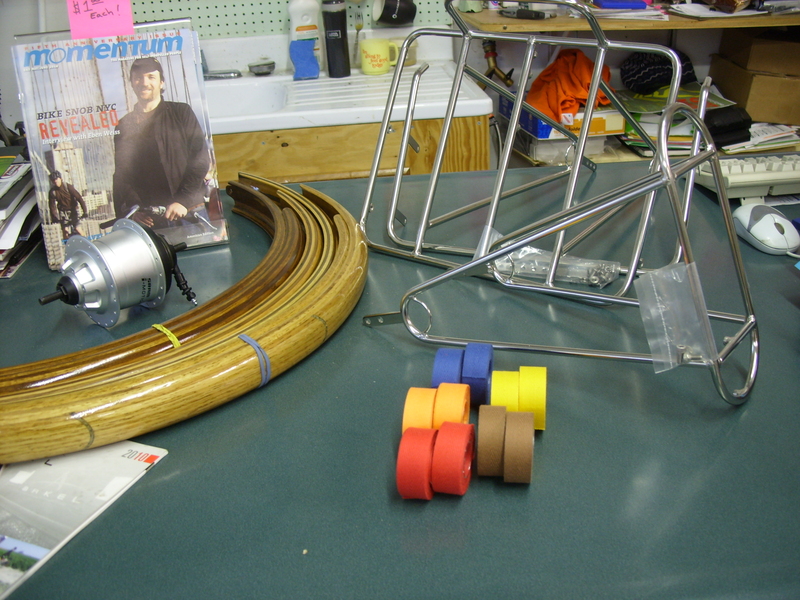 From VO imports we have the stainless steel Porteur Rack, the stainless steel Constructeur Rack, and some colorful Tressostar bar tape. Also, we have MKS half clips, sassy bells about evil and blowing up cars and stuff, as well as brass and aluminum dingers. 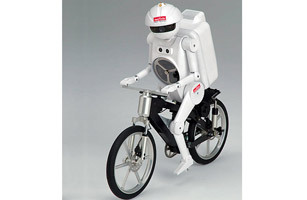 Plus, at the lower right, a battery operated Japanese bell that, at the push of a button, makes some noise and declares, “Excuse me!” in Japanese. Coolness. By all accounts ARTCRANK Des Moines has been a great success. Opening night attendance was heavy and so were sales of posters, proceeds of which go to the Des Moines Bicycle Collective. Several posters sold out completely and a few more are nearly gone. 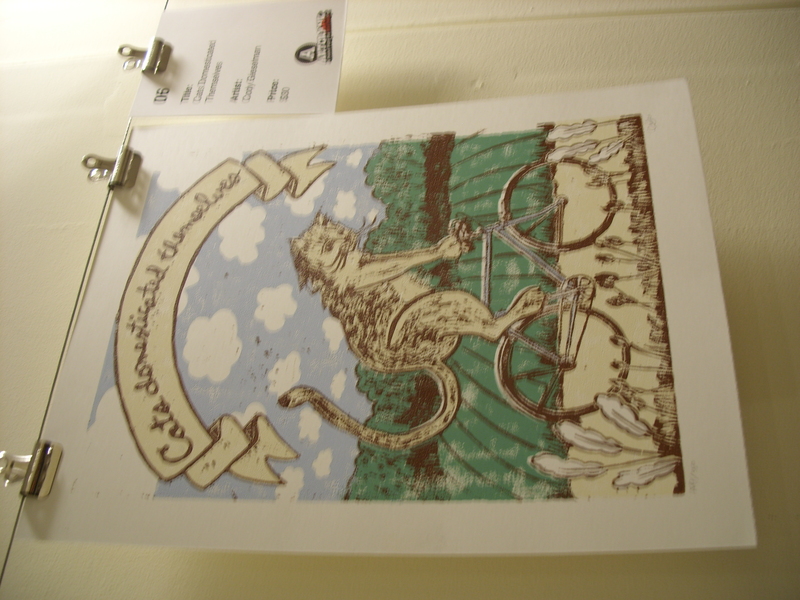 The show runs until May 29th, so you still have time to go see the work and support local art & bicycle culture. Here is my linocut poster as it hangs at Instinct Gallery. Sorry for its blurriness but opening night was madness, and I had to quickly get the shot before shuffling along to the next poster. The Des Moines Social Club was a fabu venue, and I’m excited about the gallery. 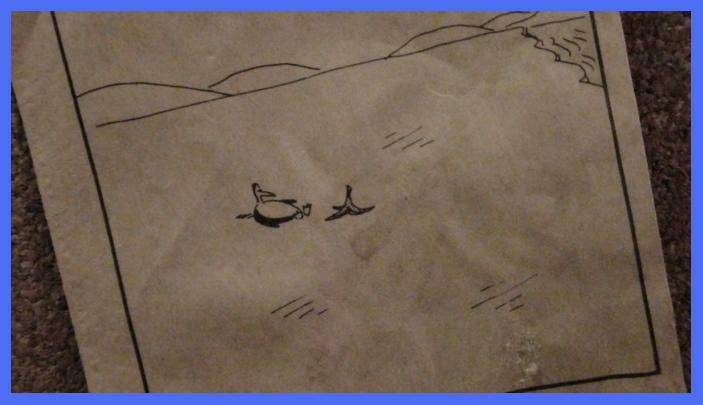 Perhaps I’ll come up with a larger project to fill its entirety? Or, maybe I’ll just enjoy my newfound freetime by spending only seven days a week at the bike shop, instead of the previous, uh, seven. Thanks to all the folks who organized the show, those who attended, and those who spent their hard-earned cash on my work!